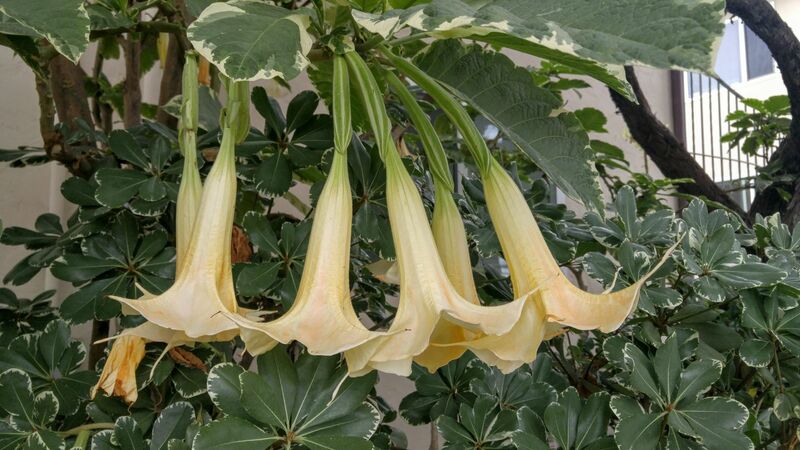 Southern Californians call their late spring overcast days “June Gloom,” and this infamous time of year has coincided with our San Diego County coastal trips. It’s always a surprise to drive down from the sun-drenched, often hot inland mountains and valleys to find beaches in a landscape of grey. 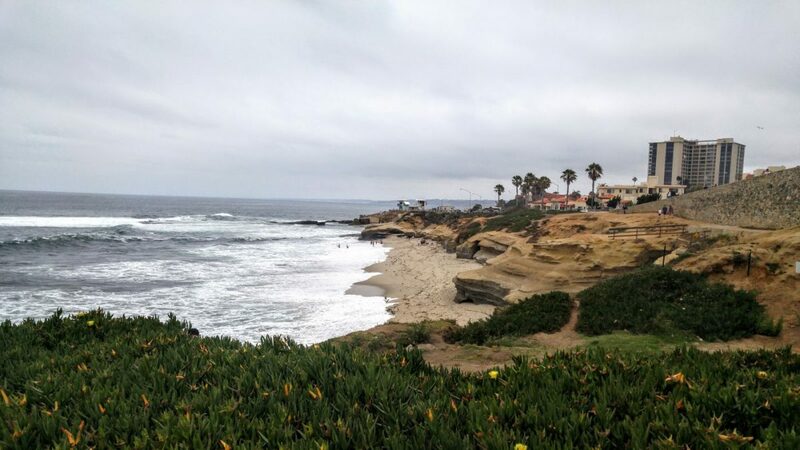 Despite the cloud-covered forecasts, we continue to hit the beaches, and this time we made it to La Jolla Cove. 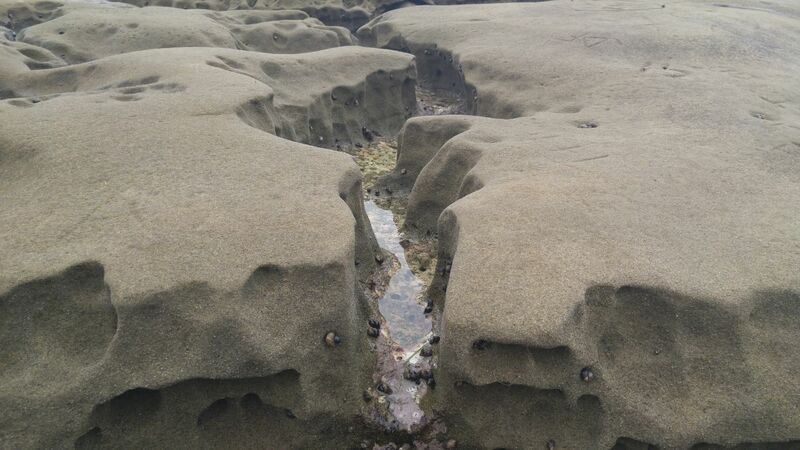 It is suggested that “la jolla” is the Spanish interpretation of the Native Kumeyaay’s word for holes. Others contend that “la jolla,” a variation of the Spanish “la joya,” or jewel, refers to “Jewel City,” a term that is popular still today. Very early in its history, La Jolla was destined to become a tourist town, particularly after the railroad found its way here in the 1890s. It continues be a major tourist attraction of San Diego County. The community of La Jolla is famous for its proximity to Torrey Pines Golf Course, home to the annual PGA Tour’s Farmers Insurance Open; University of California at San Diego; Scripps Research Institute and Institution of Oceanography; and its fancy downtown, which reminded us a bit of a Scottsdale-by-the-Sea. 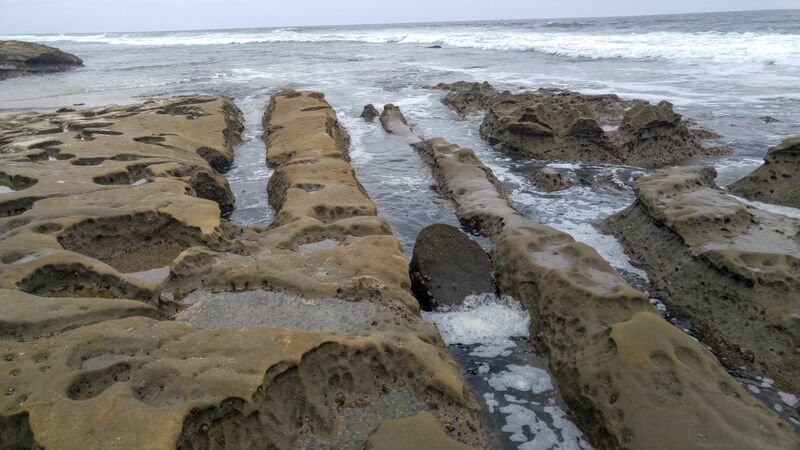 Mostly, it is popular for its miles of coastline, accessible at low tide; its tide pools, pocketed and magnified by its numerous holes and caves; its sandstone cliffs and small beaches; swimming, snorkeling and scuba diving; and, of course, the ever-present sea lions and seals, which are carefully protected as part of the San Diego La Jolla Underwater Park Ecological Reserve. Surfers, kayakers and boogie boarders are prohibited from riding the waves here. There shall be no taking of dead or living creatures, no fishing, nor finders, keepers: What you discover stays behind. Lifeguards are on patrol all day through the night keeping an eye out for this special place, so that it can flourish. 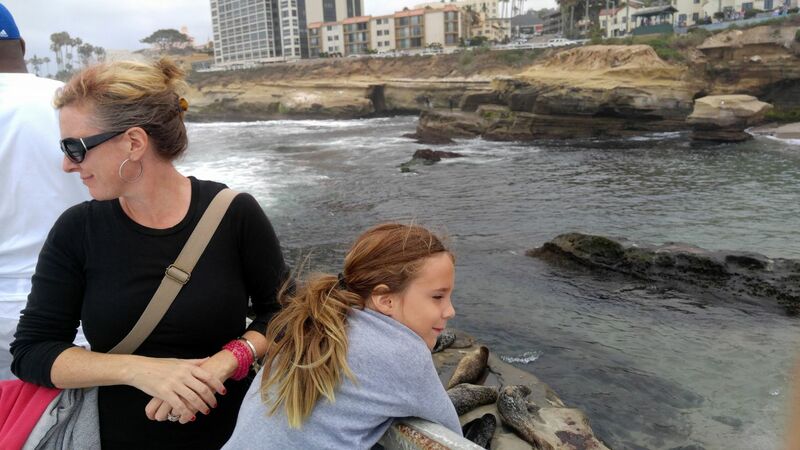 We ventured to La Jolla Cove to check out the tide pools and the sea lions, and to have a picnic. Once we meandered the tightly packed and winding streets and made it to the beach, we discovered much more. La Jolla Cove is unique to San Diego County and Southern California generally because it is surrounded by fragile sandstone cliffs, which protrude into the deeper, colder parts of the ocean. Swells can be large and the rocks and cliffs hidden and slippery: Standing or swimming close to the edge of the cliffs or tide pools is not recommended for those lacking water skills. Beaches are small, but plentiful. At low tide, one can venture onto the rock platforms and investigate all that lurks in the fabulous crevices that have been pounded out by water over time. Ocean life makes it onto and into these the sandstone rock formations, living in the holes or underneath smaller cave-like features. We found urchins, fish, crabs, shrimp and more while we were there. Lots of people gather to play here. It’s great for kids. 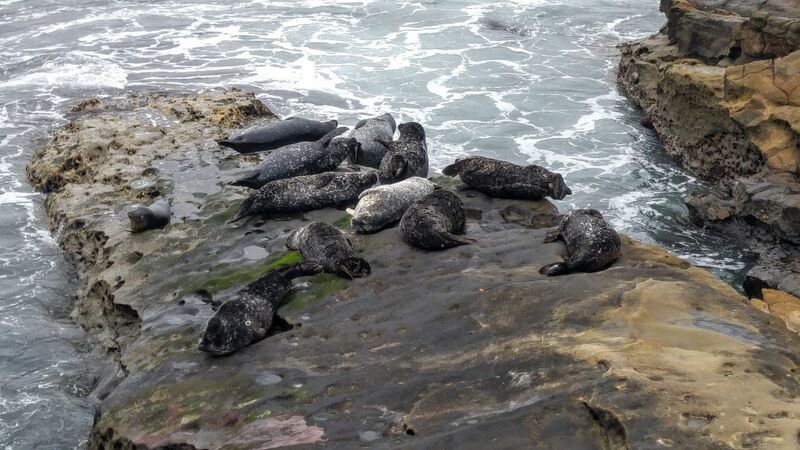 Another major draw to La Jolla Cove is the congregation of sea lions and some seals. There seems to be a growing love/hate relationship between humans and sea lions: Both are territorial and like their space. 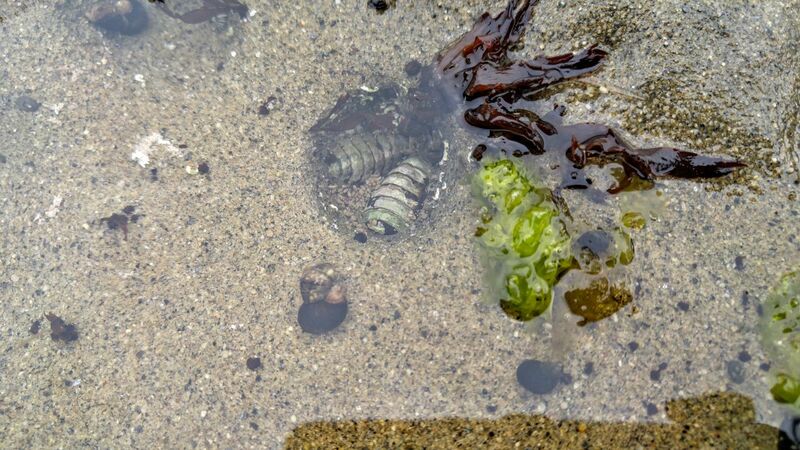 One-hundred-pound females and 900-pound males make their presence known, especially during breeding season.They have claimed many of the beaches as their own, even nipping or biting swimmers in wet suits, mounting beach-goers and excreting large poo-filled gas bubbles into the ocean. Meanwhile, humans continue to feed the sea lions and seals– deliberately or accidentally — creating a more tame environment on the beach. Furthermore, various “experts” of the region often can be overheard lamenting the old days with fewer people, who is allowed to swim or snorkel, and what the sea lions do or do not need. 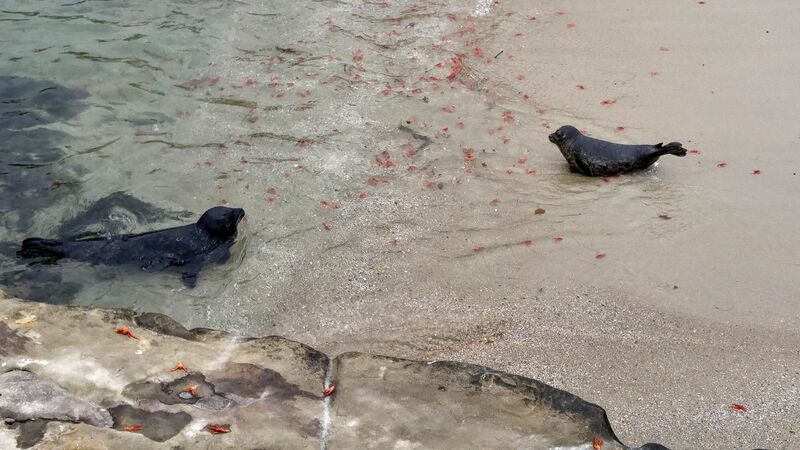 Finally, pooping sea lion pups and swaths of dead and dying shrimp make for a stinky, briny environment. 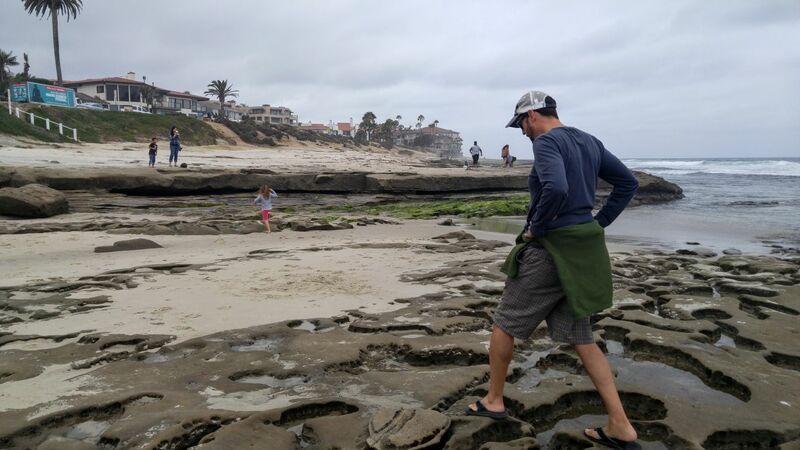 Although all of these issues are complete turn-offs for this family’s desire to swim in La Jolla Cove, lots of other folks show up to mingle with the sea lions, poo be damned. 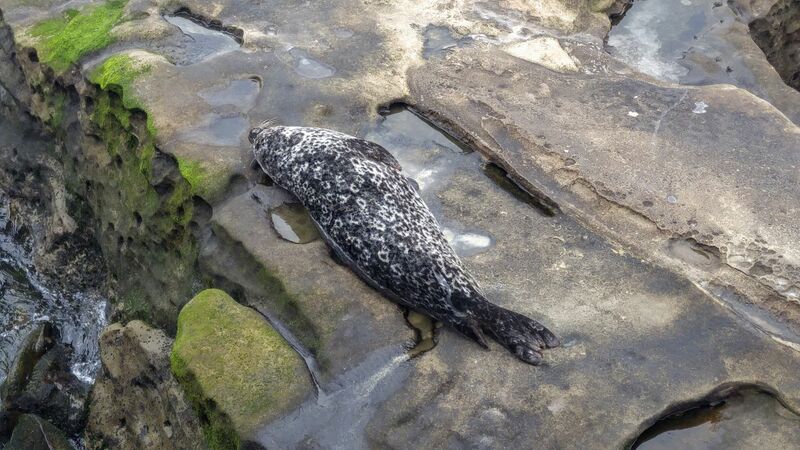 However, those are the least concerns when visiting La Jolla Cove. Observing the sea lions in nature is a joy. Odd, cumbersome creatures that they are, they have beautiful seal skins. They await the tide to push them up and over rocks, or walk along the slippery sandstone in search of a perfect spot. 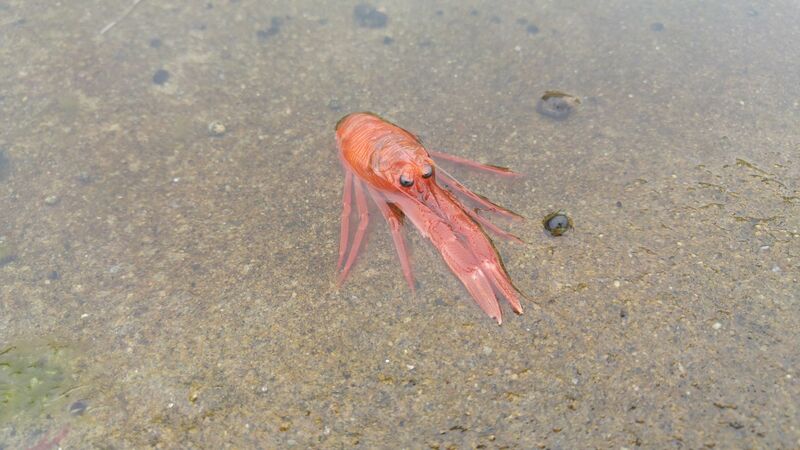 Once they hit water, they are gone in flash, only to appear somewhere farther off with a bobbing head above surface. An old, rusty and very narrow promenade extends into the water from the main lifeguard house, separating pup pool (for kids, too, when pups aren’t present) from crashing ocean waves and the basking rocks. I’m sure a long time ago when tourists were fewer and the Internet was non-existent or not as commonplace, hanging out in La Jolla Cove to watch the sea lions was easier — imagine an old school picture postcard kind of thing. Nowadays, it’s busy and packed. The promenade is dated and kind of crumbling; it is not ADA accessible in any way. The sandstone cliffs are definitely fragile and eroding. Parking is next to impossible, especially in summer (it might be best to spend the night in La Jolla to enjoy your next day during the summer months). The facilities are port-a-johns (and could be changing to solid structures soon) and the people are many. Nevertheless, it was great to return to the ocean. The waves were the biggest we had ever scene. 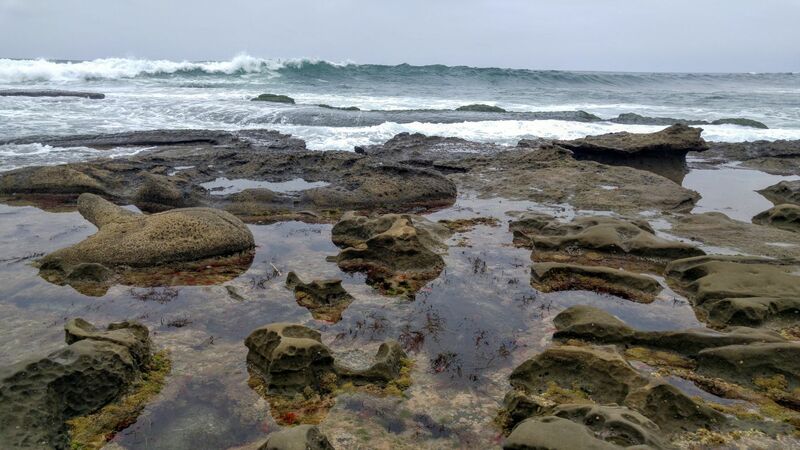 The tide pools are amazing and beautiful, and quaint little La Jolla, too. We are grateful for the promenade, crust and rust and all, so that we could hang out with the sea lions in their natural habitat. And there was plenty of space for a picnic on the bluffs. Perhaps if we are still here in the fall, we may return — for good parking, to visit the caves and take in some sunshine. It’s worth a return. We had a good day. Such a cool write-up. I’ve been to La Jolla a few times (Scripps to sell software, Tory Pines for lunch) but never to the beach. Looks like I missed out on some fascinating sights. Anxious for Luna to see Monterey some day. GREAT sea aquarium. The best.